What's Different About The California Wine Club? Discover the The California Wine Club difference and get 4 bottles of wine for the price of 2! Use promo code: JUNEWA when joining. I don't have much of a sweet tooth. No, give me some salty crunchy snacks and stand back: I could go through a whole bag of Sun Chips or whatever if I didn't know better. Although I don't despise them, sweet-and-sugary flavors are mostly lost on me. I'll take a second dish of potatoes and skip dessert. Make my coffee black and my tea unsweetened; and my wine, of course, must be dry. Save for the occasional taste of Port or Madeira, I don't much enjoy sweetness in my wine. And if you want to know what really chaps my chops, it's wine that is supposed to be dry but that surprises me with a distinct touch of sweetness in the glass. Today let's talk about a couple of white wines from France, both from regions where you can't reliably discover from the label whether there's a dry, off-dry or perceptibly sweet wine in the bottle. Vouvray is an instructive example. Made from 100 percent Chenin Blanc in the Loire Valley, Vouvray is an excellent table wine and a good ager even in the lower-end bottlings like this one. Frustratingly, at least to me, it's highly unpredictable in the sweetness department. Depending on the weather conditions during each growing season, it may range from bone-dry to moelleux ("marrow-like," a regional wine term for rich and off-dry") to rather sweet, yet the label will rarely if ever address the style of the wine in the bottle. 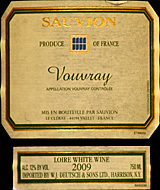 Today's first featured wine, Sauvion 2009 Vouvray, is an instructive example. I enjoy it as a good-value Vouvray, year in and year out. The 2009, however, struck me as a little more sugary than usual. It was still a good food wine with tarragon-scented chicken, but I might pass on it this year with Vouvray's other top companion, freshwater fish. The situation in Alsace is, to my mind, a little more frustrating, as unpredictable sweetness here appears to be a matter of a decision by some wine makers to abandon tradition in pursuit of critical ratings. When a few producers, notably the high-end winery Zind-Humbrecht, began winning critical raves and 90-plus point scores for new-style wines that turned from the more austere Alsatian tradition to sweeter, richer and more oaky variations, others weren't slow to follow suit. Nowadays, new-style Alsace is more likely than not to show distinct sweetness. At the risk of sounding like a nostalgic geezer, I sometimes pine for the old days. Today's other tasting, Domaine Bott-Geyl 2007 Pinot d'Alsace "Métís" boasts a little more sugar than I recall from Alsatians of the '80s, but it's kept well in balance. An organic-type wine made with certified ecologically grown grapes, its fullish body is borne in part on residual sugar, but steely acidity balances its sweetness and the wine finishes dry. Real Wineries and Real Values! Sadly, most wines found in stores and at other wine clubs are not from real, working wineries. They are made from bulk wine - wine deemed inferior and discarded by real, working wineries. Bulk wine gets purchased by sophisticated marketers, bottled in a warehouse, slapped with a lying pretty label and then sold. The California Wine Club never features wines from fake wineries. They visit every winery they feature, get to know the families and then hand-select their best wines for you. "Wow, a wine club that really cares about the wines they send!" --Tim McNally, Wine Judge and Radio Host, speaking about The California Wine Club. Special Offer: Join now and The California Wine Club will include two extra bottles of wine in your first shipment at no extra charge. That's four bottles for the price of two! Just visit www.cawineclub.com or call 1-800-777-4443 and use promo code: JUNEWA when joining. Give The California Wine Club a try! No membership fees and no commitment means that if you're not happy, you're not stuck! FOOD MATCH: Good with chicken; the richness of a tarragon velouté in poulet l'estragon using a local free-range hen made an especially effective pairing. VALUE: Fairly priced around $10 to $12; Wine-Searcher.com indicates that my local price is on the median. Here's a link to the producer's Website in English. FOOD MATCH: A little too full and aromatic for most fish, but it should be great with pork. It went fine, too, with a meatless risotto of asparagus, celery and onions with plenty of butter and Parmigiano-Reggiano. VALUE: This wine covers a surprising range of prices from $10 to $17 in the U.S., so it may pay to shop for the best buy you can find. That said, it was a fine buy at my lower-teens price. Click here for a distributor's fact card on the 2005 version of this wine. Compare prices and find vendors for Bott-Geyl "Metiss" on Wine-Searcher.com.